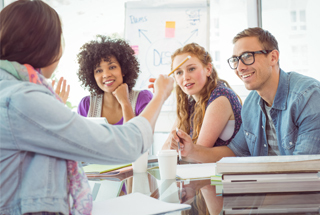 A new model of streamlining transactional business processes that were previously being done in different spaces has resulted in measurable savings from resource use and staff time reduction, and waste reduction. 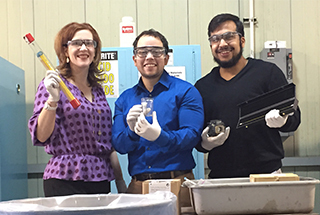 By selecting a new, in-state, waste vendor that bakes rather than incinerates the waste to recycle organic compounds and metals, the university is expected to reduce greenhouse gas emissions associated with its hazardous waste. 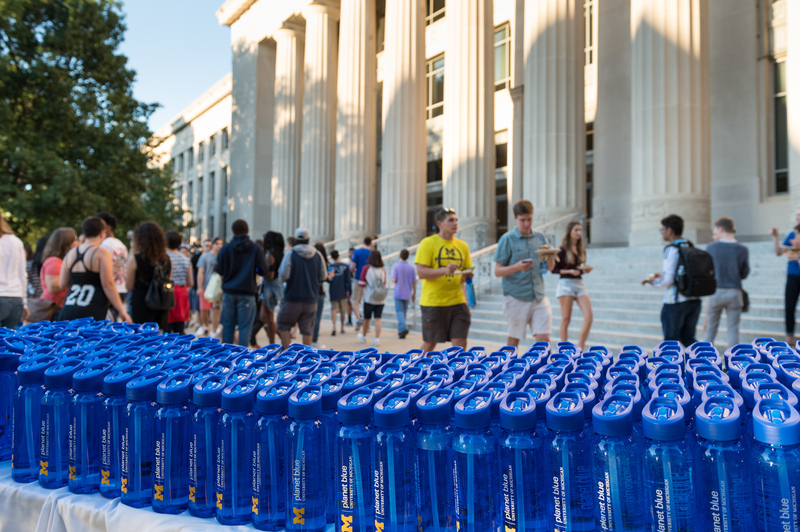 In an effort to convey a culture of sustainability, more than 5,500 freshmen attended the zero waste picnic sponsored in part by the Office of Sustainability. The event used only recyclable or compostable items, including food, napkins, plates, silverware, compostable plastics and featured the use of a mobile hydration station. Beginning in fall of 2016, the university will convert all paper & cardboard recycling bins to accept all recyclables, including paper, cardboard, plastics, tin and foil. This expansion to the university's waste reduction and recycling program aligns with a new City of Calgary bylaw requiring all businesses and organizations to recycle a broader list of materials. 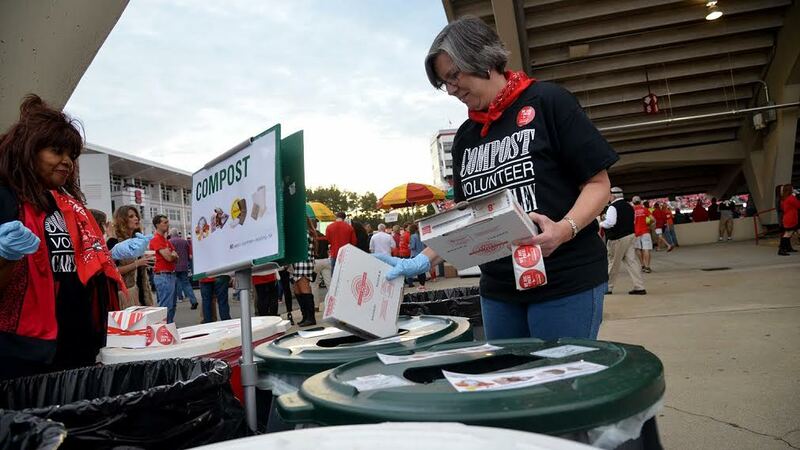 Building on the success of a compost program piloted last football season, waste stations will be located on the concourse level and staffed by student and community volunteers, who will help fans sort waste into composting, landfill or recycling bins. For the first time inside the stadium, workers who clean up after the game will separate recyclable and compostable materials from landfill items. The two new pieces of outdoor furniture were made from plastics that were discarded in recycle bins and locally manufactured into lumber-style pieces. 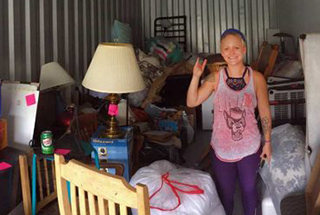 A new program called Pack2Pack connects under-resourced students within the Pack Promise program with used, unwanted home furnishings that would otherwise go to local landfills. 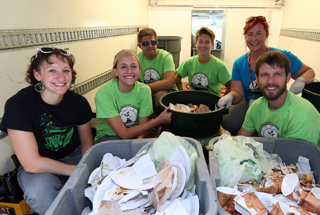 In an effort to minimize its environmental impact, Lollapalooza hired 46 Loyola students to guide festival-goers to compost food scraps, recycle appropriate materials and use refillable bottles instead of one-time use containers. The four-day festival included over 400,000 attendees. The campus-wide ban on the use of tobacco products, to begin mid-August, is part of an ongoing effort to ensure the community can enjoy the healthiest campus possible, which includes not only immediate physical health of humans, but the health of waterways. Cigarette butts release pollutants into the ecosystem as they break down. 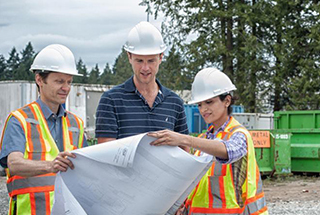 To address the cycle of urban construction that leads to demolition of abandoned buildings, a university researcher is conducting a feasibility study to examine more sustainable options for managing abandoned properties. Rather than opting for demolition, where most materials are sent to the landfill, structures would be deconstructed for reuse and diverted from the landfill in an attempt to see if a different process could have both environmental and economic value to consumers. 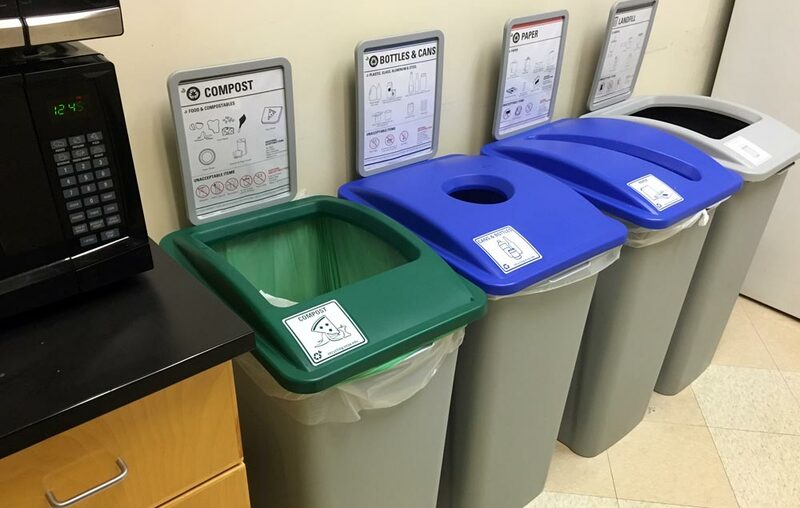 In an effort to increase the waste diversion percentage from 50 to 65, the pilot Zero Waste Workplace program, coordinated by the university’s Office of Waste Reduction and Recycling, uses composting stations, desk-side mini waste bins, and self-service recycling and landfill sorting stations in one the campus' administrative buildings, which houses University Housekeeping and the University Sustainability Office. 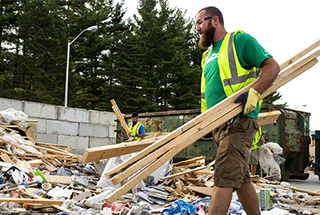 Nearly 100 percent of construction and demolition (C&D) waste from the university's General Services Administration building was diverted from the landfill by holding a sale of the equipment and furniture first, then ensuring the concrete and other debris were either reused or recycled. A recent Associated Students Council resolution calls for the restriction of the sale of plastic water bottles in on-campus locations and proposes the installation of new hydration stations as well as increased access to disposable boxed water in order to support the university’s aim to be more sustainable. In addition to implementing the EPA's Food Recovery Challenge that diverts and tracks organic waste and the Food Recovery Network that helps move food to food banks, a new student-led collaboration at the university yielded machines that grind and dehydrate food waste so that it can be more easily composted and used in campus landscaping. The National Association of College & University Food Services announced the 2016 awardees for its four categories. Outreach and Engagement winners are Brown University Dining Services (Gold), University of Illinois at Urbana-Champaign (Silver) and Virginia Tech University (Bronze). Waste Management winners are Princeton University (Gold), Colorado State University (Silver) and Johnson County Community College (Bronze). 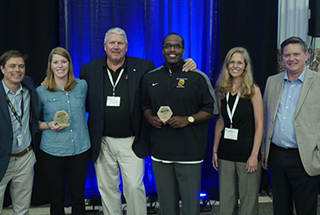 Gold, Silver and Bronze winners in the Procurement Practices category are, respectively, Harvard University Dining Services, University of Massachusetts Amherst and University of Massachusetts Dartmouth. Green Champion Student winner is Sarah Leann Ross at Colorado State University. 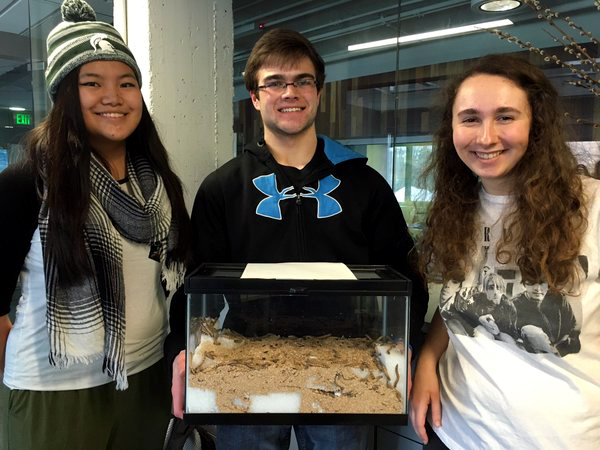 A group of students from the Residential Initiative on the Study of the Environment (RISE) program is researching the use of mealworms to degrade this material beyond the industry standard of 20 percent. 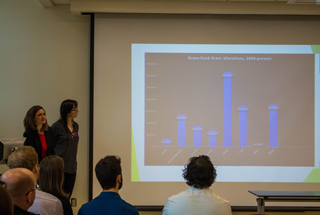 Funded by the Be Spartan Green Student Project Fund, the Meals for Mealworms project was proposed, researched and executed by freshman students, earning them an invitation to the Clinton Global Initiative University Conference. Styrecycle, a specialty recycling program created in 2016 by the university, aims to reduce the volume of expanded polystyrene headed to the landfill by using a Styrofoam densifier, a machine that grinds the plastic into small beads and extrudes it in a very dense tube. 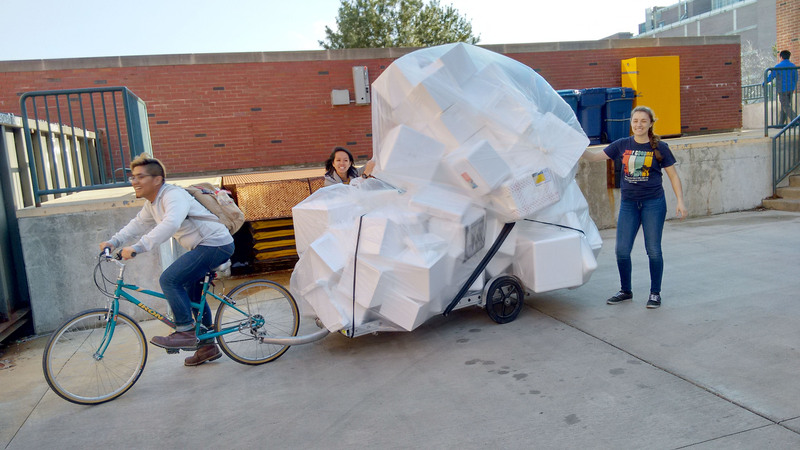 A local company in Urbana houses and operates the University-owned densifier for free in exchange for the proceeds from the sale of densified Styrofoam. 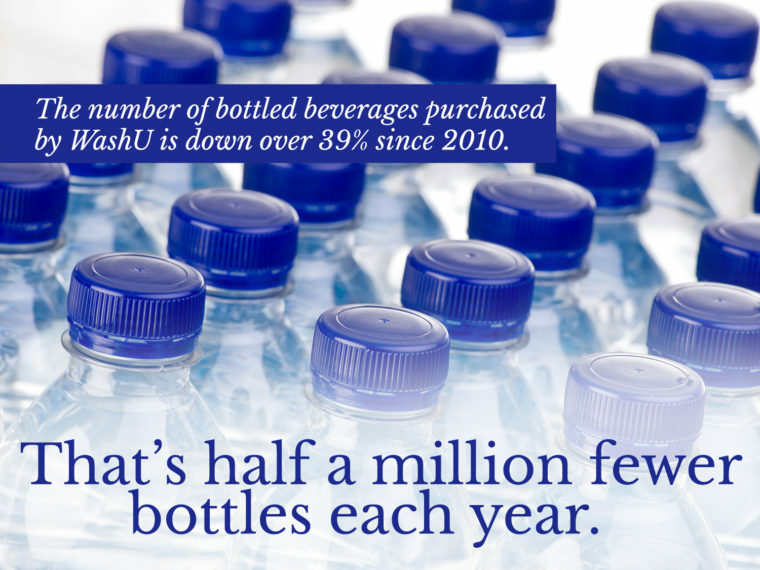 The new report indicates that bottled beverage sales at the university have plummeted 39 percent since 2009, a reduction of 567,000 bottles in the 2014-15 academic year relative to the 2008-09 academic year. The school initiated the ban as part of its comprehensive efforts to reduce its environmental impact. Richland College, a two-year community college was recently crowned Grand Champion of the 2016 competition with a recycling rate of 82 percent. Loyola Marymount University won in the Per Capita Classic category with the highest total weight of recyclables per person, and North Lake College won in the Waste Minimization category with the least overall waste per person. Overall, 350 schools across North America recycled or composted a combined total of 79.3 million pounds of materials. The university's newest effort to reduce unwanted, end-of-year move-out material from going to the landfill includes a temporary drop-off site where students can deposit unwanted items to be recycled and reused. Moving one step closer to its zero waste goal (90 percent waste diversion), Appalachian Food Services eliminated the use of Styrofoam in its facilities as of April 2016. Funded by a $10,000 award from the Projects for Peace initiative, two College of the Atlantic students aim to create a town-wide recycling system in the Lebanon student's hometown. University art students looking for free supplies and materials have a new outlet on campus that is populated with unused and donated art supplies. 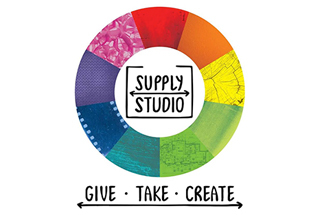 Called the Supply Studio, the initiative is a collaboration between the School of Art + Design and the Campus Sustainability Office. The U.S. Environmental Protection Agency recently announced the five universities winners of the 2015 Food Recovery Challenge as California State University, Northridge; Northern Arizona University; Rochester Institute of Technology; University of Arizona; and University of California, Davis. These institutions pledged to improve their sustainable food management practices and report their results. 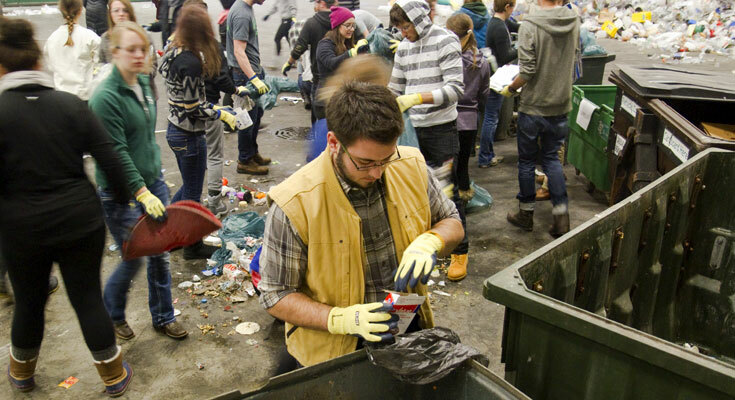 Two of four of the university's Introduction to Sustainability courses provide students with the opportunity to partner with the university's Recycling Center team to conduct a hands-on waste audit of a campus building. The Recycling Center team will use the data to improve signage and outreach materials. The Records and Information Management, and Policy Coordination Office sponsored a Disposition Day event, offering secure shredding and recycling of confidential and restricted paper documents to university business offices. 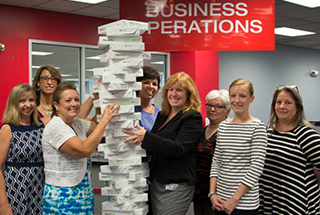 This year, 10 offices participated and 5,034 pounds of paper were securely recycled. Since late December, all of the food waste from the campus dining hall, including scraps from veggie prep, leftover food in serving trays at the end of a meal, and diners’ uneaten food, is being composted, amounting to about 720 pounds per day. 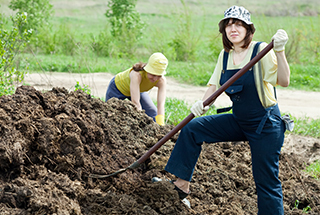 The compost that is generated is then used on the campus, year-round student farm. 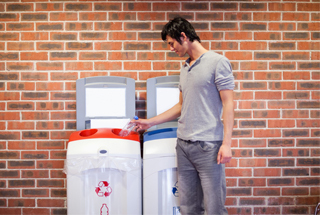 As of February, the university has mixed recycling collection that allows paper, cardboard, plastic, cans and bottles to be collected in the same bin. The effort is an attempt to meet its waste-to-landfill reduction goal. The Harvard Food Law and Policy Clinic, in partnership with Racing Horse Productions, has released a short film, EXPIRED? 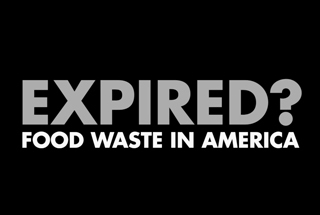 Food Waste in America, that explores how the variety of date labels on food products contributes to food waste in America. With the release of this film, the Harvard Food Law and Policy Clinic aims to raise awareness about the consequences of confusing and non-science-based date labeling, and about the impact that a uniform labeling standard could have on reducing food waste. The community college was recently identified as a Certified Green Program partner by Johnson County, along with six other organizations or businesses. The county's new sustainability program is designed to increase recycling, improve energy efficiency, decrease waste and save organizations money and resources by providing free education and technical assistance on environmental issues. Driven by the university's Student Government Association and funded by a $38,425 grant, new bins for mixed paper and plastic were installed. The bins are made from approximately 860 milk jugs. 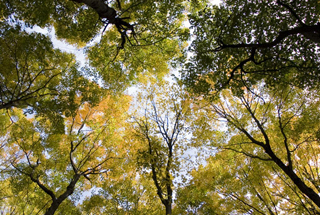 In order to preserve the university's natural areas, the university has launched a Sustainable Wood Recovery Program to recover trees that are removed from campus due to decline, storm damage or safety concerns, by transforming them into products. Known as the MSU Shadows Collection, the sale items supports the Department of Forestry and the planting of new trees on MSU's campus. Three New England universities were recently honored by the U.S. Environmental Protection Agency for their success in keeping food out of landfills. Salem State University won an award for the highest percent increase in wasted food prevention and diversion by a college or university; Clark University won an honorable mention for reducing food waste at the source; and Keene State College won an award for the best educational and outreach campaign. Twelve other higher education institutions received a Regional Food Recovery Achievement Certificate. A new initiative known as Wipe Out Waste implemented in the fall 2015 semester helped the campus reduce food waste 31.8 percent by increasing food ordering accuracy, analyzing food ordering behavior, increasing supplier accountability, recipe and proportioning compliance and using a waste-tracking tool. Plastic bags will no longer be available for students to use for carry-out meals from the Atrium, one of the university's largest dining facilities, starting mid-January. 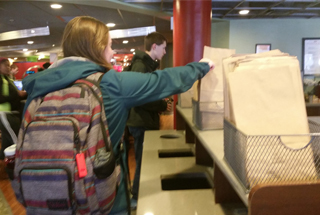 In their place, paper bags will be available, though students are encouraged to forgo single-use bags altogether. The removal of plastic bags is the result of more than two years of collaborative work between the NC State Stewards, a student organization, and the University Sustainability Office. 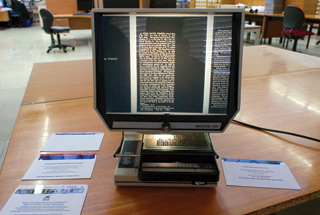 After weeding through the university libraries' collection of microfiche films, flat plastic sheets that hold very small copies of printed material, 240-pounds were found to contain copies of very old college catalogs no longer in use. In keeping with its commitment of a zero waste campus by 2021, the school's libraries collaborated to identify and contract with a recycler of the films. In an effort to have a positive effect on the impacts of food waste, the Zero Waste Campaign's first Food Waste Reduction Competition led to a 23.3 percent reduction in waste at one of the university's restaurants. The Zero Waste Campaign began as a collaboration between four student groups, including one class. 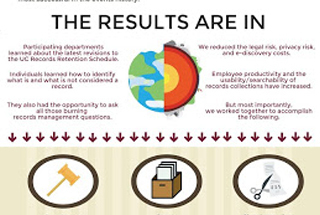 The WSJ recently discussed the successes and difficulties of recycling pizza boxes. Highlighting North Carolina State University for its innovative Pizza Box Composting Project that allows the university to divert the boxes from the landfill by using them as fertilizer.